This beautiful ring has a spectacular 3 Carat lab-created Alextraandrite in oval brilliant cut shape which is set in 14K yellow gold. This particular stone was grown by the Czochralski (cho-HRAL-skee) method, where natural components are placed in the environment in which crystals grow naturally and have the same chemical, physical and optical properties as their natural counterparts. This spectacular lab-grown Chrysoberyl Alextraandrite extrahibits phenomenal color change: it appears to be reddish-purple when seen in incandescent light and blueish-green when seen in fluorescent light or daylight. 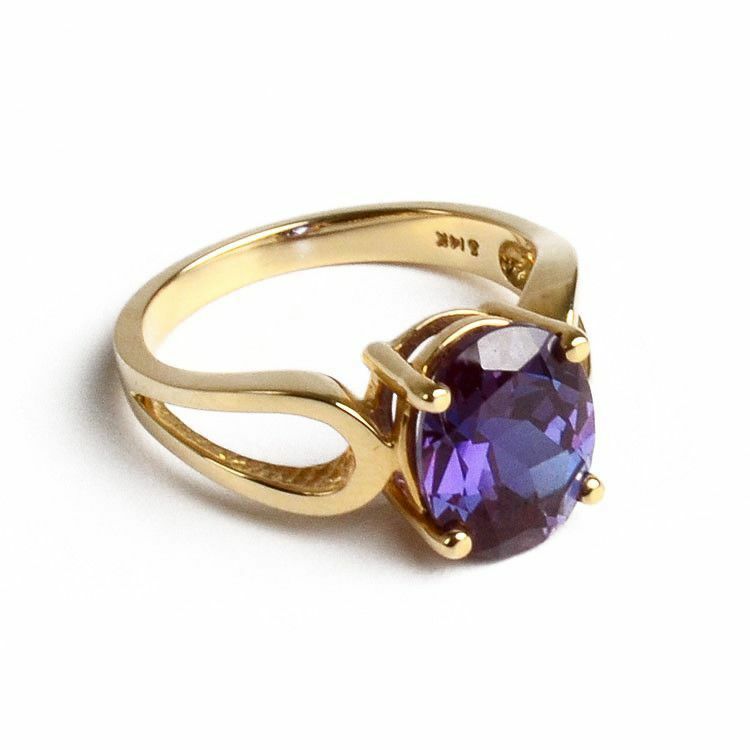 This ring can be worn for a day or night look, as an engagement ring, promise ring, or as a right hand ring. This gemstone is considered to be a stone of very good omen, which brings luck, good fortune and love. It also is the birthstone for June.